This requirement of memorization, far from being a mere guarantee of efficiency, has its own profound value: it is one more way in which the ancient liturgy demands that the celebrant “put on the mind of Christ” — or better, enter His Heart — by means of “knowing by heart” certain prayers of the Church that mold him into the image of their sentiments. If you don’t do so already, make a habit of the ‘praises’. I use them much (in Latin): the Gloria Patri, the Gloria in Excelsis, the Laudate Dominum; the Laudate Pueri Dominum (of which I am specially fond), one of the Sunday psalms; and the Magnificat; also the Litany of Loretto (with the prayer Sub tuum praesidium). If you have these by heart you never need for words of joy. It is also a good and admirable thing to know by heart the Canon of the Mass, for you can say this in your heart if ever hard circumstances keep you from hearing Mass. . . . Less doth yearning trouble him who knoweth many songs, or with his hands can touch the harp: his possession is his gift of ‘glee’ which God gave him. The culture to which J. R. R. Tolkien and Fr. Ciszek bear witness is a culture of sacred text, stability, repetition, memory, and inexhaustible meaning, even in the midst of the most barbaric conditions of war or imprisonment. Fast forward to the optimistic post-War world of the 1960s, where sacred and secular are running together, where stability is mistaken for fossilization, memory is written off as nostalgia, morals are loosening, and the givenness of tradition — in reality, a weight of glory — is felt as a chafing burden. With its programmatic variability, large number of texts, and paucity of obligatory prayers in the Mass ordinary, the reformed Missal strikes at the root of this age-old disciplining, stocking, and shaping of memory (and therefore of man’s mind and heart) by fixed liturgical formulas. Its novel instruction to speak “these or similar words” interferes with the ritual subjugation of the individual ego to the common voice of the Church. The fact that certain words are not fixed — not deemed worthy of being fixed, and worthy of being committed to memory forever — shows that the real appeal is not to memory but to imagination, the power of constructing rather than the power of conserving and contemplating. 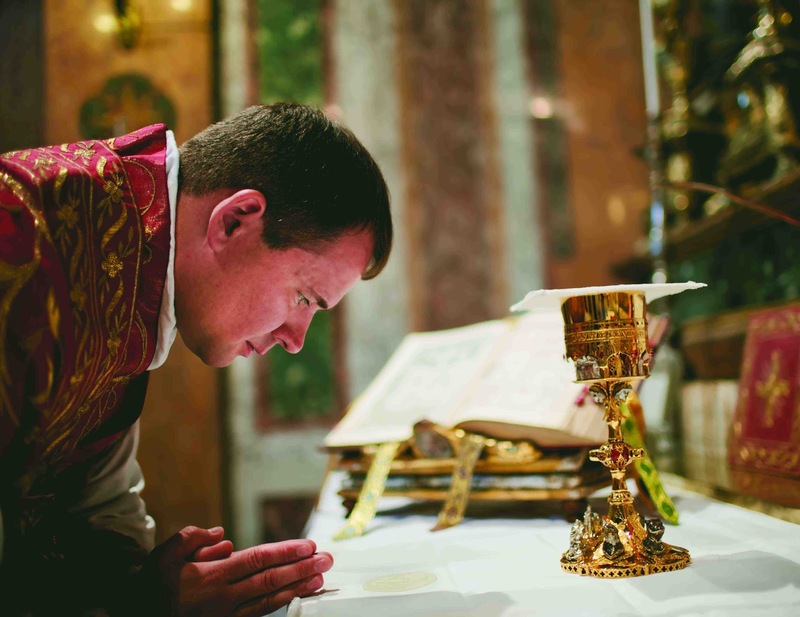 When a priest knows and says the same thing at certain moments in the liturgy, he unites in this act with all the other worshipers who know (or can easily know) the same prayer. They are brought together even if the priest is praying silently and not facing them. Paradoxically, if a priest instead uses his imagination to say out loud a new formulation of words, this content from his mind is necessarily going to be different from what might be in your mind. Thus, when the priest “uses similar words,” he becomes, by that very fact, dissimilar from you, and so, over against you in his distinctiveness, rather than together with you in a common discipleship to the given liturgy. Memory and fixed forms draw us together and make of us one body with a shared past and a shared future. Imagination and loose liturgical forms assemble us temporarily into a sui generis body that links up with no past and no heritage, which intends no future and no permanence. It is like the difference between carving stone or wood, and drawing pictures in the sand. Our identity comes from our “collective memory,” that is to say, the continually renewed remembrance of who and what we have been, and all the cultural forms that embody it. This remembrance is not primarily conceptual or intellectual but dwells in concrete, visible, audible, tangible expressions that serve as prompts for significant feelings and actions. I once read an author who described how every traditional culture has a literary canon of some kind, often made up of myths told in epic and lyric form, histories of heroes, and law codes. The artists of this culture do not see the all-pervasive presence of the canon as a burdensome limitation to their creativity but as the necessary condition for their own fruitfulness, a perpetual source of inspiration and direction that channels and intensifies their powers. They so internalize the canon that it becomes less like an object external to them and more like their own eyes and hands, through which they see and feel the world. The canon equips them with tools that nature could not have supplied, a vast vocabulary that surpasses what any individual could arrive at. The traditional Roman liturgy was just such a literary canon for the clergy, for intellectuals and artists, for the pious folk who flocked to it and were shaped by it, century after century, father to son, mother to daughter. It was the internal linguistic form of the Western Church that gave her her very identity; it was the eyes and hands through which she saw and felt creation. The liturgy was the core of the Church’s collective memory, since it was the one reality that concerned everyone, all the time, drawing the many parts into unity, and imparting a definite character to the whole. All this happens when there is a stable sacred text of inexhaustible meaning that permeates the memory of man. It still happens wherever the traditional Roman liturgy lives on. I think here of my experience learning the server’s responses at Mass as a young adult. I printed a tiny card for myself with the responses from the prayers at the foot of the altar and so forth, and used to keep it tucked into my shirtsleeve when serving. After a time, I had internalized the prayers so that the card wasn’t needed. This felt like a new step into freedom: the prayers of Mass are now completely within me. One night, when I had trouble falling asleep, I found myself running through the prayers at the foot of the altar, reciting all of Psalm 42, and the subsequent prayers. It draped a wonderful peace over my soul. When my mind is racing or I am suffering from stress, I begin to recite Psalm 42 slowly, and, comforted by its words, I become calm. Disciplined internalization of traditional ecclesial prayer leads to freedom, peace, and joy. For the one who attends to what he is doing, it opens ever more layers of meaning and levels of self-surrender. For the entire Church, it provides the inspiring example of the fusion of a person and his office, or better, the submersion of a person in his office, and weans us from the distinctively modern temptation of originality, a quality that is proper to God alone. To Him be all glory and honor, now and for ever, Amen. The Letters of J. R. R. Tolkien, ed. Humphrey Carpenter (Boston: Houghton Mifflin, 1981), 66; dated 8 January 1944. The last line is J. R. R.’s translation of Anglo-Saxon verses from the Exeter Book, which he had just quoted in their original form. Fr. Walter J. Ciszek, S.J., with Fr. Daniel Flaherty, S.J., He Leadeth Me (San Francisco: Ignatius Press, 1995), 54. It is for this reason, of course, that we should have a venerable translation of Scripture, one that preserves a sacral register and culturally weighty phrasings. Such a translation is more memorable precisely because it is poetic, striking, and resonant. This is why the New American Bible — written in “Nabbish,” a “bumping boxcar language,” as Anthon Esolen dryly calls it — is a translation that is built to fail and will never be the inspiration for any high culture. Moreover, the changing translations of Scripture and liturgical texts, such as the psalms and hymns, make it more difficult for the sacred formulas to find a place in the heart. The text of the Gloria in Latin — that marvelous hymn that has been set to great music countless times, in chant, in polyphony, in homophony, in every style — has not changed since the fourth century (!). Meanwhile, the vernacular translations of it will never be stable for long, and their musical settings are appropriately transitory. If we value divine, eternal, essential truth, as we claim to do in our Catechism, then we ought to take more seriously the potent counter-message that is being uttered by our liturgical habits. Photo courtesy of Corpus Christi Watershed. All rights reserved.